From SS. Cyril and Methodius we inherited also the Old-Slavonic Liturgy. Our "Hospodi, pomiluj" became part our religious consciousness and we feel deeply moved every time we hear it chanted. During the second World War an American soldier from Philadelphia, Pa., came to our Seminary of St. Josaphat in Rome to attend the Divine Liturgy. When the Liturgy was over, he vividly described to us his great nostalgia to hear once more the Divine Services in Old-Slavonic. While in Rome, it took him three days to find the Greek Catholic church. And indeed, it was Greek, the church of St. Athanasius, connected with the Greek Seminary in Rome. In desperation, he asked one of the seminarians where he could find the church where they sing "Hospodi, pomiluj." Since the Greek seminarians, during the war, stayed temporarily with us in the Seminary of St. Josaphat, the seminarian immediately brought him "home." Sgt. Peter S. continued: "Reverend Fathers, you don't know how much I longed for our Slavonic Liturgy. When in the chapel I heard our "Hospodi, pomiluj" for the first time in three years, my heart exulted and I began to cry for sheer joy." Yes, every Divine Service, every celebration of the Holy Liturgy in our Slavonic tongue fills our hearts with a deep spiritual experience and some nostalgic longing for God, even if we do not understand the meaning of the words. Our Slavonic Liturgy is indeed a precious gem in our Cyrillo-Methodian heritage. Since SS. Cyril and Methodius came to us from Constantinople, they brought to us Christianity in their native Byzantine Rite. In Moravia they found traces of the Latin Rites ( Roman, Gallican or, even, Ambrosian ) and under the pressure of the Frankish-German missionaries they partially used the Roman Liturgy of St. Peter, which they translated into the Slavonic. Nevertheless, it is beyond any doubt that SS. Cyril and Methodius in their ritual and worship followed the Byzantine Rite. The Liturgical Books, brought by SS. Cyril and Methodius to Moravia were translated by them into the Slavonic tongue and were also Byzantine. Thus, in Moravia, they implanted the Byzantine-Slavonic Rite, which became the common heritage of our ancestors, too. In the ninth century there were already two types of liturgical services in Byzantium: monastic and cathedral. The latter was a more elaborate type with complicated ceremonial and solemnities. It was suited more for large cathedral churches, hence its name. It comprised only morning ("Utrenya"-Matins ) and evening ("Vechernya"-Vespers ) services. On the eve of more solemn festivities, Vespers were joined with Matins by the penitential or rogatory processions, during which various prayers, psalms and hymns were chanted. It became known as "Litiya" (Gr. litajno-to entreat, to supplicate) or better, as "All-night Vigil." The monastic type of worship was longer, but much simpler in its ceremony. Besides Vespers and Matins, it included: Chasy (the Hours ), Povecherije (Compline) and Polunoschnicja ( Midnight Service). This type of service was adapted also by the rural churches. From the Slavic Life of Constantine we learn that St. Cyril, after having "translated all the Liturgical Books, taught his disciples the Matins, Hours, Vespers, Compline, and Misturgical Liturgy." From these words we can conclude that SS. Cyril and Methodius introduced into Moravia a Monastic order of services (i.e. Typikon) and gave us all the services practiced in the Byzantine Rite. Even to this day in our churches we follow--the Monastic Typikon. The main reason for translating the liturgical books into the Slavonic tongue was the apostolic desire to reach the hearts and the minds of a common people, since Slavonic culture developed outside the sphere of Latin and Greek. The only possible way to reach Slavic peoples was through their own language. Giving the Slavs their own alphabet and liturgical books, the missionary brothers considerably enhanced the Slavic culture and made it genuinely Christian. Thus, Christianity, through its Slavonic Liturgy, made a deep impression on the cultural and spiritual development of the Slavs. After the death of St. Methodius (+885) His disciples in Moravia were persecuted and exiled. They found new haven in Bulgaria and Macedonia, where they were gladly received by the enlightened Czar Boris I (+888) and generously supported by his successor, Czar Simeon the Great (+927), By far the most learned monarch of his times. 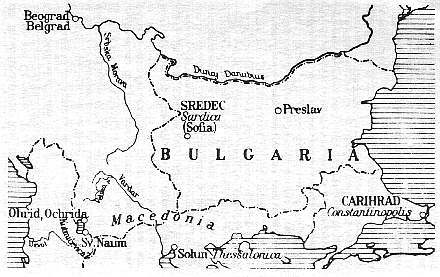 Thus, Bulgaria became a bulwark of the Byzantine-Slavonic Rite and Slavonic culture, especially at the monastery of Ochrida, where many distinguished disciples of SS. Cyril and Methodius settled down (see the map-Lacko, Sts. Cyril and Methodius, Rome, 1963). Ochrida and Preslav, where Cyrillo-Methodian ideals were perpetuated. Since the persecution of Slavic missionaries an Moravia did not extend to the border regions of the realm the Byzantine-Slavonic Rite continued to flourish in Galicia and Carpathia. Thus the Slavonic Liturgy became an integral part of our spiritual heritage since the Cyrillo-Methodian times. Among all the liturgical services the prominent place was always given to the Divine Liturgy. It was handed down to us in triple form: 1) Liturgy of St. John Chrysostom, 2) Liturgy of St. Basil the Great, and 3) Liturgy of Presanctified Gifts. The oldest liturgical tetx is from the eighth century, called "Codex Barberini". It is written in Greek and at the present time it is preserved in the Vatican Library. Besides the above mentioned three Divine Liturgies, the code contains some prayers from Vespers, Midnight Service and Matins, as well as some parts of the Euchologion (the administration of the Sacrements and Sacrementals). In the monastery of Mt. Sinai, there is preserved another code, also in the Greek language, called "Codex Porphirianus," from the time of SS. Cyril and Methodius. Thus we know exactly how the Apostles of the Slavs celebrated their Divine Liturgy. From Cyrillo-Methoddian times we have some excerpts of the Holy Scripture in Slavonic, but not a text of teh Holy Liturgy. The oldest formularies of the Old-Slavonic Liturgy are from the twelfth century: 1) Liturgikon of Anthony Romanovich and 2) Liturgikon of Barlaam Chutnicky, both from the Eparchy of Novgorod, in Russia. It was the Metropolitan of Kiev, Cyprian Tsamvlak (1370-1406) who, after the Philotean Liturgical Reform rearranged the Old-Slavonic Liturgy to its present form. The Cyprian Liturgical Reform became more effective after the invention of printing. The first Litugikon in the Slavonic language was printed in Venice, in the yera 1519, according to Serbian tradition. According to the Rusyn recension the first Liturgikon was printed in 1617, at the printery of Vilno, White-Russia. But it was only in 1629 that the Rusyn tradition became somewhat stabilized by the Liturgikon of Peter Mohyla, published in Kiev. The second edition of the Mohylian Liturgikon, published in 1638, was somewhat improved and became a typicla formulary of the Divine Liturgy among all Ruthenains in union with Rome (including Ukrainians and White Russians). Since subsequent editions began to introduce some liturgical changes without any authority, the Liturgical Commission of Rome published in 1940 a typical text of the Holy Liturgy, which binds all the Rusthenians to the present time. Thus our liturgical services were once again brought back to the standards of the Kievan tradition. In our rite an important is played by the Liturgical Chant. SS. Cyril and Methodius were both very well educated in music, and they indeed "enriched the Moravian Church with chant and spirtual songs" (cfr. Slavic Eulogy ch. 13). MOst probably, the brothers applie the MAcedonian liturgical chant, as also their dialect, to the Slavonic worship. The chant was furthur developed by their disciples in Ochrida, Macedonia. While the liturgical chant in Galicia developed under the influence of Kiev or rather Potchaiv, our ancestors, adhering closely to the Cyrillo-Methodian tradition developed their liturgical chant according to Macedonian patterns. Of course, through the years, our melodius singing, because of lack of musical education on the part of our cantors, became somewhat spoiled. Nevertheless, the enchantment of spiritual mysticism is still preserved. Let us cherish and preserve our great spiritual treasure, our Slavonic Liturgy with its melodius chant, as a sacred trust of our venerable ancestors.